We visit Wikipedia (and wonder if teachers who forbid its use might want to think again), touch on journalistic ethics, have a quick look at the online citation generator EasyBib, and finish at the gates of Turnitin, the software which will “check students’ work for improper citation or potential plagiarism” (Turnitin OriginalityCheck). Most sources agree: Hamilton Naki was a gardener at the University of Cape Town. He was recruited into the experimental animal laboratories, where he cleaned the cages. He was asked to assist in some of the experiments and operations on the animals, and proved so skilful that he was asked to do more and more complicated work. He assisted in organ transplant operations. Christiaan Barnard himself was instrumental in seeing that Naki finally gained the recognition he deserved. “Hamilton Naki had better technical skills than I did,” he said in an interview. “He was a better craftsman than me, especially when it came to stitching, and had very good hands in the theatre” (Hamilton Naki, 6 June 2005). And this, from Naki’s obituary in the medical journal, The Lancet. “Hamilton Naki had better technical skills than I did”, Christiaan Barnard said in an interview. He also believed Naki was “one of the great researchers of all time in the field of heart transplants”. On Dec 2, 1967, Barnard asked Naki to be part of the surgical team in what became the world’s first successful heart transplant on Louis Washkansky. Naki was a key member of the team that worked on the heart of the donor, Denise Darvall. (Kapp, 2005). Naki’s part in the transplant operation was kept secret for years, and only became known, and slowly, after the end of Apartheid. 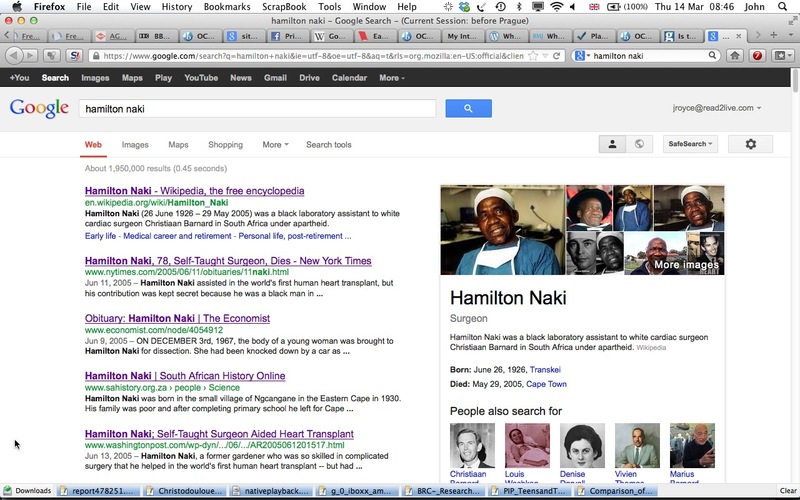 For Hamilton Naki was black, uneducated, and no way (goes the story) could it be admitted that he had played a key part in the operation; he should not have been allowed in the operating room, he should never have touched a white woman, dead or alive. His role had to be kept very, very secret. The story did get out, once Apartheid had ended. In 2003, he received an honorary doctorate, from the University of Cape Town. A film, Hidden Heart, was made, revealing Naki’s part in the operation. When Naki died in 2005, the world press published obituaries, the New York Times, The Economist, the Lancet, the Washington Post, and many many more. I remember reading the Economist obituary at the time, in the print edition. It was a heart-warming story, what a shame he was not appreciated at the time, unable to use his talents to the full, accepting that he had to keep his part in the operation secret. And this is where we are setting out from, our strange journey is just beginning. Scrolling down, we find more authoritative sources: The Telegraph, The Lancet, BBC News, Encyclpedia Britannica, NCBI (PubMed)… Wow! 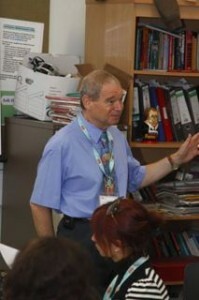 This man was important! It isn’t until Google hit number 16 that there is a hint of anything amiss, and many searchers won’t get that far. 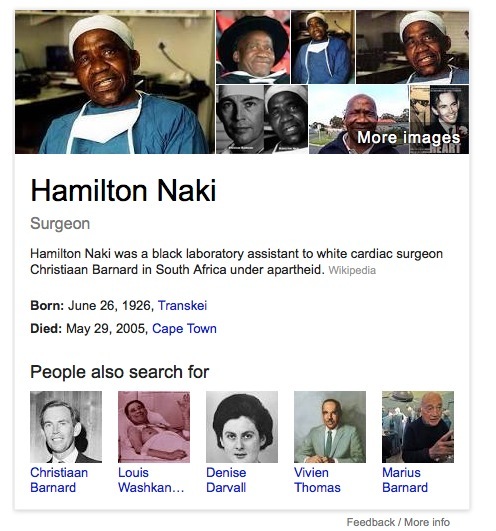 “Our obituary of Hamilton Naki (BMJ 2005;330:1511) claimed that Mr Naki, a former gardener, had directly assisted Christiaan Barnard in the world’s first heart …” (British Medical Journal). Several magazines and journals published corrections. I read the correction (Apartheid’s shadow) in the Economist some six weeks later. It seems that his skills as animal surgeon are true, and that he played a great part in the background research which informed human heart transplant operations. Barnard may well have seen him perform transplants of animal organs. But he was nowhere near the Groote Schuur Hospital when Barnard performed that first heart transplant operation. There are no accusations of fraud. The Economist article goes on to suggest that various statements made over the years had been misinterpreted, taken out of context. It is possible that Naki’s mind and memory may have become confused, that he may have been pressured into (mis-) remembering his time and his work at the hospital. It could well be a case of people wanting the story to be true, so it became “true” – accepted. Until it was refuted. And, looking at those top Google hits, you do not get a hint of anything wrong with the picture, with the story. Hit number 1 is Wikipedia, and many students are warned not to use Wikipedia. They are told and taught to seek out the reliable sources, the authoritative sources, so they are more likely to go to the New York Times, The Economist, the Washington Post articles, and if they go on digging, to BBC News, or The Lancet. Only the most persevering will scroll down to the BMJ Correction, and begin, possibly, to think again! There are two or three hits on the way down which do mention the controversy: the South African History Online article, and Britannica (though the Britannica article is so short, the searching student might well think there is nothing new there and not read it). But right at the start, there is Wikipedia, the free encyclopedia which anyone can edit. Wikipedia carries the story, and the counter-story as well. It’s all there. Wise teachers advise students to use Wikipedia but with care, not to rely on what is found there, always to verify what is found. The best articles have references, the sources from which the writers got their information. Follow up on the references (don’t just assume they are accurate), and then cite those as sources. I recently discovered Retraction Watch, a blog which monitors science journals for retractions. The number of papers retracted each week for one reason or another is quite amazing. When an article is retracted, it may or may not be removed completely from the online journal. There will certainly be a notice, prominently placed, drawing attention to the retraction. See for instance, this retraction notice at PLOSone. It is easy to add a retraction notice to online articles. It isn’t possible with print journals, all that can be done is to print a correction in a later edition, and hope that anybody reading the original paper or article also reads the later correction. Although immediate correction is not possible with papers published in print, it is certainly possible with online publishing. But what responsibility does an online publisher have, not simply to print an online correction or retraction, as did The Economist (with “Apartheid’s shadow” – but actually to add a notice to the original page? The BMJ managed to add a notice to the original online obituary. The BBC News team, and many others too, evidently did not notice, nor publish the revised version of Naki’s story. There are also the tricky questions: whether to update the original paper or article, or to add corrections separately (making sure they are well signposted), or to link to corrections made later and elsewhere? Is it ethical to choose to ignore corrections and retractions, once made aware of them? Is it ethical to change and correct the original, and not note that this has happened? Every so often, in school librarianship forums and listservs, someone raises the question of online citation generators. Which is the best citation generator, BibMe, EasyBib, EndNote, NoodleTools, Son of Citation Machine? There are dozens of them. In a recent discussion on IB’s OCC (a closed forum for IB practitioners), there was strong support for EasyBib, it’s quick and it’s easy and it’s automatic. With most other citation generators, you have to complete a form: find the author and fill it in, find the title and fill it in, and so on. Say “when,” click on the button, Abracadabra, and there’s your citation in whichever style you have chosen. EasyBib, though, you just have to submit a URL or an ISBN, and EasyBib does the rest, voilà! Easy! No work involved at all, a minimum of tedious form-filling. EasyBib tells you when it cannot provide a reference, and tells you when its information is incomplete. It signals if you need to check a little more and complete the rest of the form manually. But these instances are many, and I sometimes think more than EasyBib devotees are aware of or will admit. Fair enough, insert it yourself, copy-and-paste. Leithead, Alastair. “Gardener Behind Africa’s Heart Pioneer.” BBC News. BBC, 05 Sept. 2003. Web. 16 Mar. 2013. And only the most aware will notice that EasyBib has got the date wrong, that 9 May 2003 has become 5 September, 2003. Go figure! Yes, EasyBib is easy, it’s quick, and it’s often wrong! Just to be fair, I’ll be looking more closely at EasyBib in a later blog post. I just threw this in as it’s current, while I’m looking at the Naki story. I mentioned Retraction Watch earlier. I must mention that I discovered this blog, thanks to Turnitin. But that’s another story, another post. Watch this space! This entry was posted in Journalism, Research - verification and tagged citation generators, corrections, EasyBib, Naki (Hamilton), research, retractions, review of the literature, verification, Wiipedia by John Royce. Bookmark the permalink.